Kahil El'Zabar's Ethnic Heritage Ensemble, with Kahil El’Zabar on drums, percussion, kalimba and voice, Alex Harding on baritone sax, and Corey Wilkes on trumpet, including a duet tribute to poet Ntosake Shange, featuring Kahil and poet Dine Watson. For all who believe in Freedom of Speech and Freedom of Expression, The EHE has recorded dozens of internationally acclaimed projects, and the membership over the years has showcased some of the finest and most accomplished improvisers in creative music. 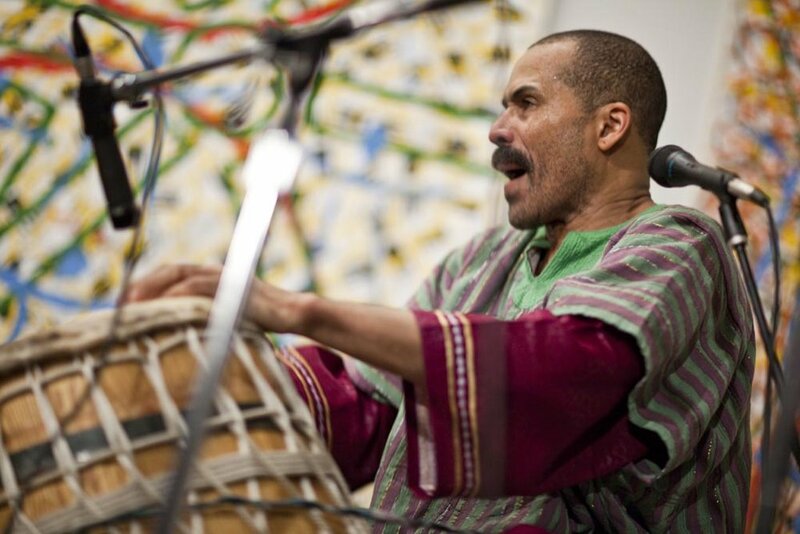 Internationally renowned percussionist and composer Kahil El'Zabar is considered one of the most prolific jazz innovators of his generation. Indeed El'Zabar is a true "Renaissance Man," with a musical style and content that flows from ancient Africa to the modern world. Music holds no boundaries for El'Zabar, who has not only played alongside a myriad of jazz greats such as Dizzy Gillespie and Cannonball Adderly, but was in the bands of Stevie Wonder, Nina Simone (who he also designed clothes for) and Paul Simon, as well as recording with rock bands like Sonia Dada and Poi Dog Pondering and heading up the jazz/house outfit, JUBA Collective. At the age of eighteen, he joined Chicago's Association for the Advancement of Creative Musicians, and by 1975 he was chairman of the organization. During the early 1970s, El'Zabar formed his own musical group, the Ethnic Heritage Ensemble, and later another group, the Ritual Trio, with both of which he still performs. His talents have also extended to the cinematic arena, scoring and appearing in three feature films. El'Zabar was also chosen to do the arranging for the stage performances of The Lion King, he has published a book of poetry, Mis'taken Brilliance and he tailors clothing both for his band and for others. From 1996 to 1999, El'Zabar organized Traffic at Chicago's Steppenwolf Theatre, an inter-arts program featuring music and poetry. In 1991, El'Zabar was commissioned by Germany's Leverkusen Jazz Festival to present a 20 year retrospective of his work, which showcased Orchestra Infinity - a 25-piece big band formed several years ago.